Russ Feingold-Senate race: Wisconsin Democrat will try to reclaim his old Senate seat from Republican Ron Johnson. Former Sen. Russell Feingold announced Thursday he’ll run for the seat he lost in 2010. 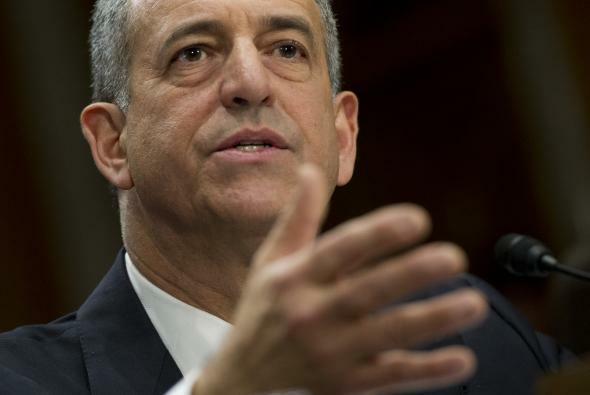 Former Sen. Russ Feingold wants his old job back. The Wisconsin liberal announced Thursday that he will run for the Senate seat that he lost five years ago, setting up a high-profile rematch with Republican Ron Johnson and giving Democrats renewed hope, however small, that they can reclaim the upper chamber in 2016. Feingold served 18 years in the Senate before he was ousted in 2010 by Johnson, a chief executive of a plastics manufacturer who captured the attention of the tea party in his first political campaign. (That Johnson was willing to spend $8 million of his own cash on the race didn’t hurt either.) Johnson won the seat by 5 points, 52 percent to 47—although recent polling suggests he no longer enjoys the same support at home. A Marquette Law School survey conducted in April found Feingold with a 16-point lead on the incumbent. The Wisconsin Democrat’s probably best known for the campaign finance overhaul he co-sponsored with Sen. John McCain. That measure—creatively known as McCain-Feingold—banned so-called soft money donations, which in a pre-Citizens United world were lamented in much the same way super PAC spending is today. As the Associated Press notes, Feingold was also a progressive leader on foreign policy and unafraid to break with his party during his time in office: He was the only senator to vote against the Patriot Act, the first senator to propose a timetable for an exit in Iraq, and an outspoken critic of President Obama’s decision to ramp up the war in Afghanistan. Feingold’s entry into the race is good news for Senate Democrats, who need to pick up five seats in next year’s election to be assured control of the upper chamber. (If Hillary Clinton or some other Democrat were to win the White House, they’d need to pick up only four seats to gain control thanks to the vice president’s tie-breaking Senate vote.) Working in Democrats’ favor is a friendly electoral map—Republicans are defending 24 seats compared with their 10—and the fact that traditionally Democrats benefit from a stronger liberal turnout during presidential election years. Still, there won’t be much margin for error. The University of Virginia’s Center for Politics’ latest Senate map, for instance, labels only five Senate races true tossups—including the likely Johnson-Feingold showdown—and if the rest of the center’s handicapping holds true, Democrats would need to win all five and the White House to regain control of the upper chamber.